Not sure where to start on this one. I really want to jump to the stunning conclusion, but I know I should take it step-by-step.This is Peanut Butter Cup from Stone Ridge Creamery, the in-house brand of all the SuperValu owned supermarket chains (that's Shaws for me). It seems that every chain has an entry level (low cost) store brand and make no mistake, Stone Ridge Creamery is not messing around. What we have here is vanilla ice cream with peanut butter cup pieces and ribbons of fudge & peanut butter. Notice I said ribbons, not swirls - we'll get back to this shortly. Ok, view from above (sorry for the shadow, this was the clearest of the bunch). There use to be two huge peanut butter cup pieces in the bottom right corner, but I just couldn't help myself - yeah, they disappeared, and they were pretty good too! Unfortunately, most of the pb cups have been broken down into some pretty tiny pieces. The number of bits in a stone ridge flavor are always small, but it would have been nice to have seen bigger chunks. Never mind though, look closely at that ribbon on the right. oh yeah! that is some quality layering going on there (I apologize for the image being a little yellow). Now, I stared at it for a few minutes, so I'm not sure if the fudge ribbon is right next to the chocolate ribbon, or if they are actually one in the same. It's just that the ribbons are so delicate, I can't tell if they have just naturally come together or if it's on purpose. Sorry for talking in circles, I guess I'm just thinking (typing) out loud. You get the idea though. 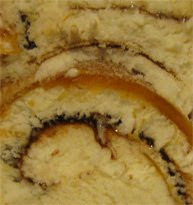 These are thin ribbons that wonderfully come together, this isn't your usual chunky swirl. It's just really cool to see a swirl mixed in like this. I'm impressed, what can I say? Had enough of me talking in circles? Well, that's what happens when a post gets interrupted about a 1000 times, but I want to get this out there so you can see this very cool and budget friendly flavor. Overall it's a nice peanut butter flavor that's not too strong. The chocolate is definitely second string here - we shall say this is peanut butter chocolate and not chocolate peanut butter. My only complaint here is that the peanut butter left an aftertaste that seems just a smidge off; maybe a little too dry so it leaves that "texture" in your mouth that makes you crave a drink. It's not enough to stop me, but I'm tempted to go rinse it down with a few sips of ice cold milk. My biggest complaint overall, but I always say this, is that there just aren't enough peanut butter cups. They're definitely pretty tasty, but I want more. MORE MORE MORE MORE .....please (can't forget my manners). In fact, I'd like to throw something out there. I have been enjoying your entry level Stone Ridge Creamery brand ice creams, and I've been delighted by your Culinary Circle ice cream desserts. I'm glad you've joined the market because, as always, I welcome any and all players to the world of ice cream production. Now, can I make a suggestion? Why not release your own budget-friendly pints of premium ice cream? Take a pint of peanut butter cup, maybe tweak it so its a little more creamy and heavier, and then just bury it in pb cup pieces. In fact, just so people don't get confused, I think we need to give it a different name. 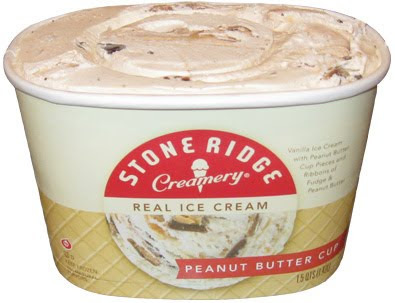 May I humbly suggest "Dubba's Premium Peanut Butter Cup Ice Cream - by Stone Ridge Creamery". What do you think? Not only do I offer my name, but I will gladly help sample the new flavors and make sure they have that perfect "balance" (aka lots and lots) of mix-ins. How can you beat the Dubba stamp of approval? Oh yeah, it has to have one of those spoons in the lid so people can pick them up at lunchtime. Let me know when you are ready to start production. Being British I find it so hard to find peanut butter products... but I would love to try something like this! 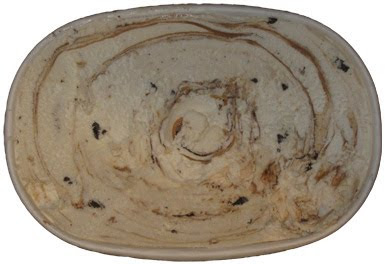 i just enjoyed the best bowl of SRC moose tracks - loved it!! !